There was a time when we had just letters to communicate with people who were away! As decades passed, we do now have plenty of options, even as to bring the real feeling of a meeting. Out of these, Video Conferencing is indeed a revolutionary method. Simply put, you can get the audio and video from any minute part of the world. In short, video conferencing creates an interactive environment where two or more people can communicate at the same time. Unlike its starting times, common users and professionals use video conferencing. Small businesses use it to conduct in-team meetings without having to pay for transportation. In addition to communication, the web meetings are used for product demos, screen sharing, tutorials, webinars etc. But, to get the best out of it, you need to select the best video conferencing services for your firm. In this article, we have a list of best 10 Video Conferencing services you can go for. Some of these tools are suitable for both needs. At the same time, some other tools are dedicated for organization-based needs. Google Hangouts is a popular video conferencing service, developed and served by Google. Anyone who has a Google account can use Hangouts to make video calls and talk. Along with Video Chat, Google Hangouts also offers options such as Instant Messaging, SMS and VoIP Services. In addition to personal chat, it can be used for creating group video conferencing as well. Here, you can add up to 10 members in a single Hangout. If you are using Google Apps for Work, you can have up to 25 members in a Hangouts video chat. In short, Google Hangouts is an awesome option for small organizations and personal needs. You can share your screen during a Hangout, which is a good option. Skype has been the first name to strike when we think of video conferencing. Just like Hangouts, Skype can be used for making video and audio calls, along with instant chat messages. You can either use the web-based platform or clients for Windows, Mac and Linux. It also offers Smartphone apps for Android and iOS devices. Skype Video Conferencing allows you to have a group video chat with up to 10 people. However, if you purchase the Business version of Skype for $2/month, you can add up to 250 people in the group video call. Talking about the video conferencing, there are inbuilt options for file sharing and screen sharing. Despite Skype problems, it seems Skype is yet another suitable option for small organizations. 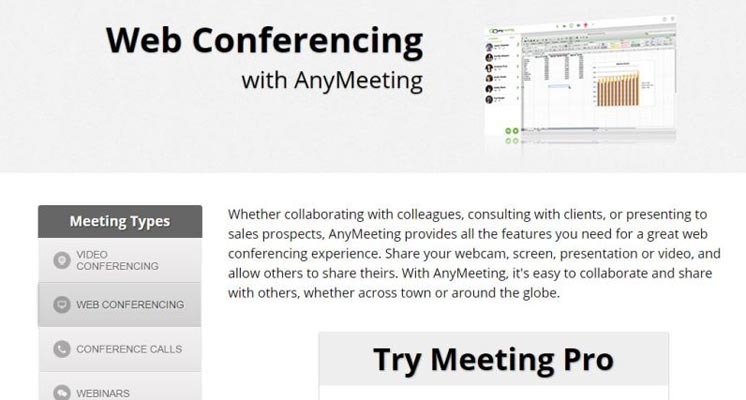 AnyMeeting is an organization-friendly solution to conduct online meetings as well as webinars. Thankfully, they do have two different plans for both needs. With its Meetings Pro package, you can have maximum attendees of 6 in a video conferencing. It needs to be noted that the video conferencing is done as a part of the online meeting service. In AnyMeeting, you get a bunch of features too. There is Screen Sharing, Meeting Notes and YouTube Video Sharing. AnyMeeting costs $18 per month, or you can get it by paying $180 annually. You can have free AnyMeeting account, but the Pro features are worth what you pay. Even though the number of attendees is low, it’s a good option for the organization needs. ooVoo online is one of the best video conferencing services for personal purposes. You can create a group video chat with up to 12 of your friends using ooVoo online. The best part is that it has been optimized for mobile devices, like your Android, iOS and Windows Phone. Along with that, ooVoo apps are available for Windows PC, Mac and Intel RealSense devices. It is completely free to use, but you will have to tolerate those ads. To remove the ads, however, you can go with Pro version. There are additional features too in the ooVoo package. For instance, you can share the YouTube videos via video chats or leave video messages. ooVoo Online also lets you record the group video chats and save it in your PC. GoToMeeting is a dedicated solution for conducting online meetings that is what popularly known as GoToMeeting conference calls. In these meetings, you have support for video conferencing, audio calls and other notable features. It offers three premium plans to choose from. Its plans are priced at $24, $39 and $49 per month, allowing maximum attendees of 5, 25 and 100 respectively. HD Video Conferencing is available in all the plans, but you get additional features like Recording, virtual whiteboard, Mobile Apps etc in the higher plans only. When compared to Skype or Hangouts, GoToMeeting is able to provide a dedicated online meeting experience. There will be no compromise made on video conferencing HD quality or security. You can count on GoToMeeting when you need the best video conferencing service for your huge team. There is also a GoToMeeting chrome extension available on chrome store. Want to do a video conferencing with strangers or peer group? Then, Tinychat is one of the best services you’d have. The Tinychat app is available for both iOS and Android and you can access the service via these apps. You will need an account in Tinychat to proceed. Once you have set it up, you can either join the chat-rooms or create your own chat rooms for Tinychat group video chat. When you want to use Tinychat for business-based meetings and all, you can simply create a chat-room and invite your colleagues to the room. Tinychat isn’t a secure option for conducting video conferencing. On the other hand, you can use it only in the worst-case scenarios. At the least, Tinychat is completely free to use and it is possible to add up to 12 live cameras. 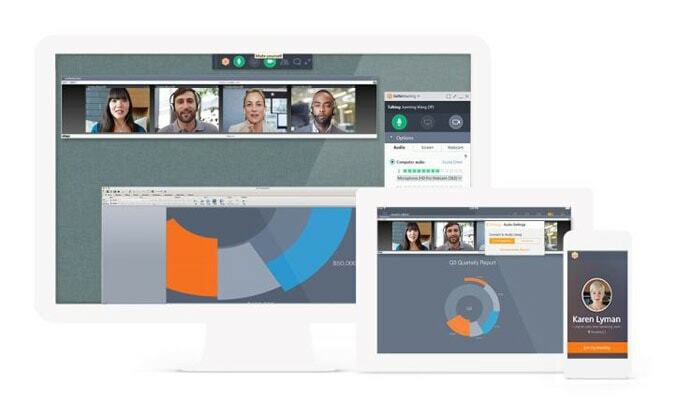 As you can guess from the name, Cisco WebEx Meetings is yet another best option for dedicated meetings! This has been one of the most trusted options for seamless video conferencing for organizations. 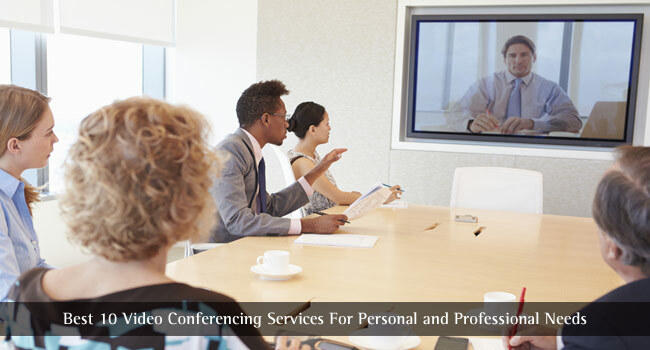 WebEx video conference service offers various packages for different needs. In the case of Meetings, you can pick one from the Free or Premium package. In Free, however, you can video conference between two people only. 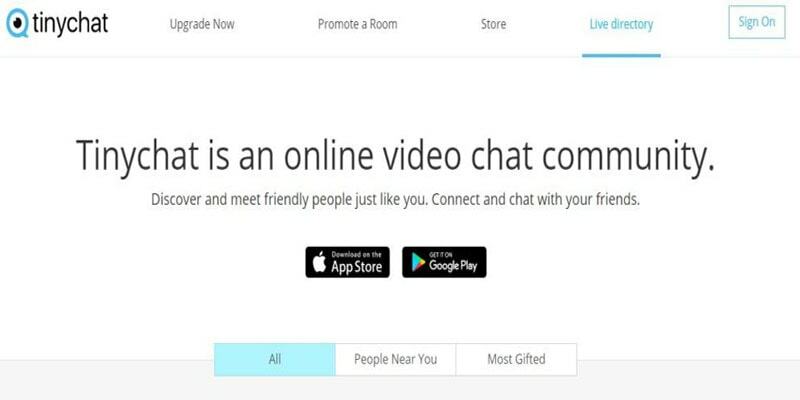 In the premium range, you can have up to 100 users in a single video chat. For that, you will have to pay $69 per month, which seems reasonable enough. Other features of the premium range include Screen Sharing, VoIP, Whiteboard support and Free mobile apps. It’s the best when you are ready to pay for quality. 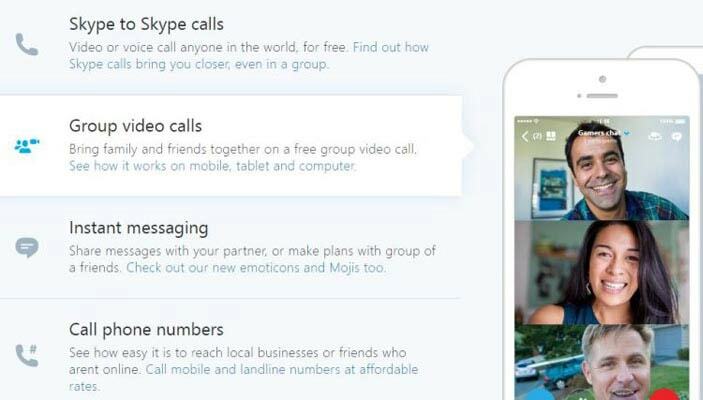 Fring is a free video conferencing service that lets you make video calls from your mobile. Along with that, you’d get features such as VoIP calls and Paid internet calls. Fring is available for a variety of mobile platforms, including iOS and Android. A few years back, Fring was popular as a Symbian app for making calls for free and all. On a personal note, I remember struggling to install Fring in my Nokia 2690 ( and, returning, out of despair ;) ) However, in Fring, it’s possible to create a group video call with a maximum of 4 members. So, it is surely for personal video conferencing. This app does not have brand-new UI or something, but it does the job when it comes to video conferencing. Used by major brands like Sony, Apple, and Uber, ClickMeeting is an impressive way to conduct video conferencing in your organization. The best part of this online meeting software is that it’s not just limited to video conferencing. On the other hand, it can be used as an effective collaboration tool as well. It is a premium service, whose basic plan is available for $30 per month. In this, you can have up to 25 attendees. If you would like to conduct a webinar, plans allows you to have up to 1000 attendees for $280 per month. Talking of the features of ClickMeeting review, there are a lot. You get a customizable meeting room, full control over desktop sharing and remote access etc. After all, it isn’t for your personal needs. Appear.in is the new way of conducting group video chats. The best thing is that appear.in does not require any sort of registrations or sign ups. So, when you are desperate to have a group video conference between two people, you can count on appear.in. 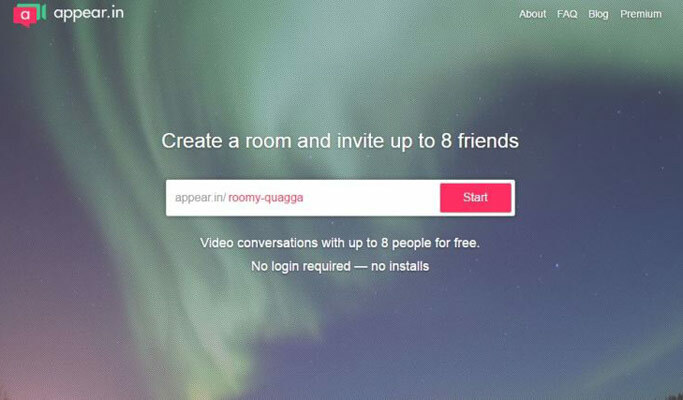 You need to create a video chat room in appear.in and invite other people into that. Inviting is done through URL Sharing or Facebook messaging. Either way, in seconds, the other person can join your chat. It’s not many features to talk. You can add up to 8 people into the video conferencing, and it’s just about the URL. It also has apps for iOS and Android, which is a good thing. All in all, we would say appear.in is the best minimal solution for video conferencing. It’s completely free to use, too. So, we have seen the best video conferencing services you can use! As we said, some are for organization-based meetings while others are for personal users. For instance, Skype and ooVoo works well for personal needs. At the same time, platforms like appear.in can be used for both purposes. You can pick one depending on your budget and need of features. Good to see a well-crafted post :) Now video conferencing made easy. Well explained in-depth post buddy, will be glad to try them one by one. Good one again. Keep throwing quality informative content. I will be glad to read them. I knew about Skype and Hangout, but I never knew about the other platforms you shared here. Learned something new today. Thank you so much for sharing this amazing post! Thanks Abhijith for sharing such a nice article about video conference. I am happy to learn few more platform that you have mentioned. It’s also an important communication tool in day to day business activity. 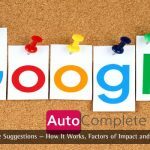 This article helped me to explore more such platforms. That’s a nice list. There are a few more like hipchat which is good. But skype is one of the best and beat many of them. We use it normally when dealing with our overseas clients. I think google hangouts has become more popular and I personally use google hangouts. Thank you very much for the above list of video conferencing tools. You can also add on premise R-HUB HD video conferencing servers in the above list. It works on Windows, MAC, Android, iOS etc. and provides 30 way HD video conferencing.